Poor drainage on your property is a constant threat to your landscaping and needs to be addressed. Drainage problems can cause erosion, property damage, damage to buildings and foundations, and they can be very expensive to repair. Every properties drainage issues are unique but there could be a number of ways to address the problem and solve it once and for all using proven drainage control methods. What Type Of Drainage Problem Do You Have? Do you have low spots that pool up with water? Do you have soil erosion due to heavy rain? Do you have soft spots in your lawns or gardens? Do you have standing water around your foundation? Basement leaks due to water buildup around your foundation? Without proper drainage in place your landscape and lawn areas can be prone to flooding, it can drown out your expensive plants, erode away and undermine expensive hardscaping such as a patio or retaining wall, and it can even cause damage to your structures and their foundations. Green Acres Lawn & Landscape is a licensed and insured Kansas City landscaping company that specializes in problem solving drainage issues. We specialize in installing new drainage systems and offering solutions for property owners with a drainage problem. Many of our clients properties suffer from poor drainage or have drainage systems that just weren’t implemented correctly from the start which has led to significant erosion problems, water pooling, soft spots, and flooding in their lawns, gardens and landscapes. We can help solve these problems. Does Your Property Have Water Drainage Problems? Drainage issues should be addressed during the landscape design process and before your actual landscape is installed. Because every property we work on is different a good landscape designer will take the time to understand how water may flow from your property, what type of soil conditions you have, and they will also know and understand the rainfall in your area and/or how high the static water table might be. Knowing all of these factors can help us plan out an effective drainage solution for your specific property. It’s often during sustained and heavy rainfall when a drainage problem will surface. After a few days of rain, a property with poor drainage will become obvious. You’ll visibly see water pooling in low spots, you may see erosion taking place, and a host of other problems. If the water table (sub-surface water) is high in your area, then rainfall only makes the problem that much worse. There are some simple tests we ca do to determine the extent of your drainage problem. This is a simple test any home or property owner can do or we can do. Step #1. Choose an area of your property that might be in a low spot. Step #2. Dig a hole approximately 2′ x 2′ (two feet deep and two feet wide). Once the hole is dug, put your hose in it and fill it up with water. If the water drains away within an hour your drainage is sufficient. If you fill the hole with water and it takes 6- 12 hours to drain, then it’s a pretty good sign you may have drainage problems. If it takes more than 24 hours to fully drain, then there is a major drainage problem that could contribute to extensive damage on your property if it’s not addressed with an effective drainage solution. A high water table can pose a challenge for any landscape. The water table is water that lies close to the soil surface. It can vary depending on where you are located. If you have a high water table then the low lying areas of your landscape can often have pooling water. Often the best solution for a high water table is to plant appropriate trees, shrubs, and other plants that are capable of handling these wet, boggy, conditions. These are often plantings that natively grow in riparian areas. Another option to solve a high water table drainage problem is to raise the lawn areas or planting and garden bed areas up. You can do this by mounding up areas with additional soil and appropriate plantings to keep it held together or you can even used raised garden beds. If your property has clay-based soil then you may have problems with surface water pooling up. Clay is a very dense material and doesn’t allow for good drainage. 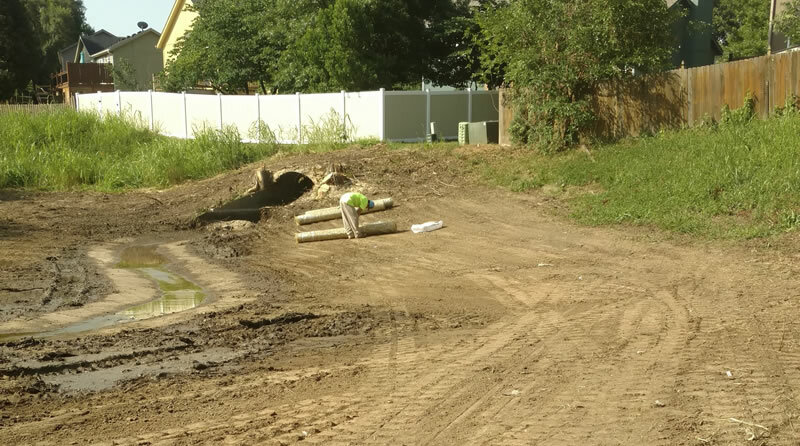 Surface water issues can often be solved by properly grading the property away from the home and into a swale or french drain that can channel the water away from your property and into an existing storm drain or drainage ditch of some type. One of the most popular and effective drainage systems to install for a surface water problem is the French drain. This is a time-tested drainage solution that gathers water and channels it to a place underground (usually a trench filled with gravel and perforated pipe) where the water can take its time percolating down through the dense clay soil. Hardpan or “Soil pan” as it’s sometimes called is a very dense layer of soil found below the topsoil layer. There are different types of hardpan but they all share the general characteristic of being a distinct soil layer that makes it very difficult for water to permeate and drain through. Some hardpan drainage problems are formed by deposits in the soil that bind the soil particles. Others are man-made problems, such as hardpan formed by compaction from using heavy machines on the property such as skid-steers or excavators. If your property suffers from hardpan it’s really important to implement a site-wide grading and drainage plan. This often needs to consist of an underground system of perforated drainage pipes fed by french drains. This can help channel the water away from the hardpan soil and into a proper drainage ditch or swale. Careful Construction Practices – Often drainage problems surface after extensive construction or site-work has been completed on a property. Activities such as removing and placing fill, property grading, and digging of foundations or footings can alter the drainage on a property. When construction occurs on your property care must be taken to avoid compaction of the soil and also to make sure that your property is graded to channel water away from low-lying areas and your home or buildings foundation. Regulate Your Irrigation System – Many irrigation systems are setup to deliver water to a lawn, garden, or landscape over a set period of time rather than on the needs of those specific plants. It’s a good idea to set your irrigation to meet the needs of your specific landscape rather than set it on a timed schedule. For example, if you’re irrigation system runs for an hour in the evening, but the plantings are sufficiently watered within 10 minutes, that extra 50 minutes of watering doesn’t make much sense and likely contributes to the poor drainage issues. Check For Broken Plumbing Or Sewer Lines – In some cases, poor drainage, or pooling, standing water can be the symptoms of a broken, clogged, or corroded sewer or drain line. If your drainage issues are accompanied by a foul sewage smell, then this could be part of your problem. We also see pooling water caused by broken municipal water pipes or sprinkler pipes. The broken piping causes the excess water to pool near the surface. Adapt Plantings To Site Conditions – If your property is continually suffering from drainage problems due to a high water table then it’s a good idea to make sure your plantings are “drinkers” you want to carefully select plants, trees, and shrubs that require lots of water or that thrive in excess moisture. If you’d like to schedule a consultation to discuss your drainage system or to correct drainage issues you might be experiencing with your property we’d be happy to meet with you. Please call (913) 422-5111 or fill out our online form and we’ll get right back to you.